Know someone interested in a mantel clock but you're not sure which to buy? 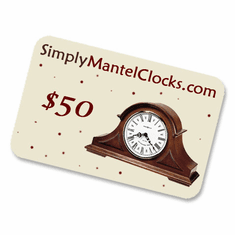 Simply Mantel Clocks' Instant Gift Certificates are the perfect way to give them exactly what they want. Our Instant Gift Certificates are redeemable for anything on our site.